The Real Football Network is escaping to the Margaritaville state of mind for the Coconut Podcast called Margaritaville Football. As Jimmy Buffett’s tour traveled across the country this year, production coordinator Heikki Larsen sat down with football personalities to talk sports, music, living the Margaritaville lifestyle and more. Heikki’s guest this week is Ohio State Buckeyes football coach Urban Meyer. Read more about Heikki's backstage interview with Coach Meyer here: If you’ve ever seen Coach Urban Meyer on the sidelines, you’ve seen intensity. Having met him on a few occasions now, I can say that intensity is an energy that follows him throughout his day. It’s why I was a little nervous backstage this past summer in Cincinnati. 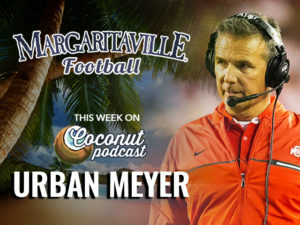 On his one day off of the year, Coach Meyer was coming to the Jimmy Buffett concert and had agreed to do an interview for Margaritaville Football. Coach Meyer has followed Jimmy since 1984. He was a student at the University of Cincinnati and was asked to be a security guard for a Buffett concert. He had no idea who Jimmy Buffett was, but after the concert he was a fan. He and Jimmy finally met at the University of Florida when Coach Meyer invited him to a game, knowing Jimmy’s passion for the Gators. After his first championship season with the Gators, Jimmy brought Coach Meyer on stage in Tampa where he presented the coach his very own blue and orange Margaritaville Frozen Concoction. Coach Meyer tries to make it to one Buffett concert a year to spend a day mentally in Margaritaville. It’s his way to shut off the coaching, the hyper focus and the drive as he sings out loud with his friends and family. I’ve seen Coach Meyer at Buffett shows and there’s a smile on his face. He even seems relaxed. His wife, Shelley, takes the wheel that day and lines everything up, from tailgating and tickets to transportation (she would make a great road manager in the music business!). 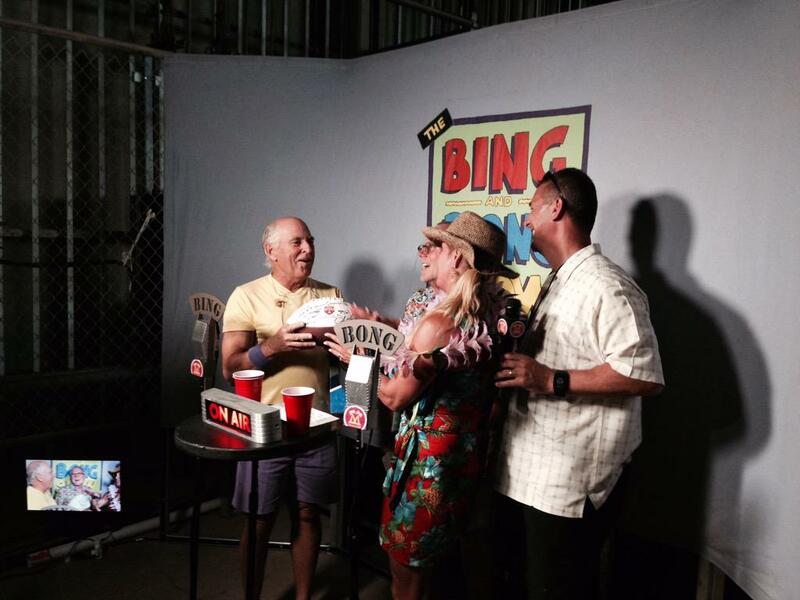 Before the concert, Jimmy has Coach Meyer make an appearance on The Bing and Bong Show on Radio Margaritaville (pictured left) and then, like a real fan, the coach walks out to his seats in the crowd to experience the event. As we talked on my tour bus during sound check I learned Coach Meyer’s first sport was baseball. He was even drafted by the Atlanta Braves! I asked him how baseball went for him and he said, laughing, he was so good at baseball that he’s now a football coach. Throughout the interview I continued to see a funny, joking nature about him that is rarely seen or heard. He was all smiles and the anxiety I felt went away as soon as I pressed the record button. Thank you, Margaritaville! Listen to the full interview with Coach Meyer here. Author Heikki Larsen is the Production Coordinator for the Jimmy Buffett Tour and the writer and producer of Margaritaville’s Coconut Podcast.